When the terror level rises, move the terror track marker up the terror track as indicated. The terror track marker cannot leave the track, so the terror level cannot go above 10. Once the terror level has reached 10, if it ever increases again (via a Mythos card special ability, for example), instead of moving the terror track marker, add one doom token to the Ancient One's doom track for each point the terror level should have increased. The most obvious effect of the terror level is that people pack up and leave town. For every point the terror level goes up, select one Ally card at random from the Ally deck and return it to the box. That Ally is no longer available for the rest of the game. Once all Allies have been returned to the box or claimed by investigators, this specific result has no effect for the remainder of the game. "That's it. I'm Moving the Shop to Boston". If the terror level reaches a sufficiently high level, the Curiositie Shoppe, the General Store, and Ye Olde Magick Shoppe close for the rest of the game. If the terror level reaches 3, place a closed marker on the General Store. It is closed for the rest of the game and no one may enter that location. Immediately move any investigators and monsters currently at the General Store to the Rivertown street area. If the terror level reaches 6, place a closed marker on the Curiositie Shoppe. It is closed for the rest of the game and no one may enter that location. Immediately move any investigator or monster currently at The Curiositie Shoppe to the Northside street area. If the terror level reaches 9, place a closed marker on Ye Olde Magick Shoppe. It is closed for the rest of the game and no one may enter that location. Immediately move any investigator or monster currently at Ye Olde Magick Shoppe to the Uptown street area. "Look at All the Monsters". 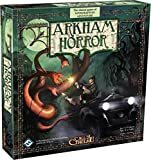 If the terror level reaches 10, the town of Arkham is overrun by monsters and the monster limit is completely removed from the game. There is no longer any limit on the number of monsters that can rampage through town.